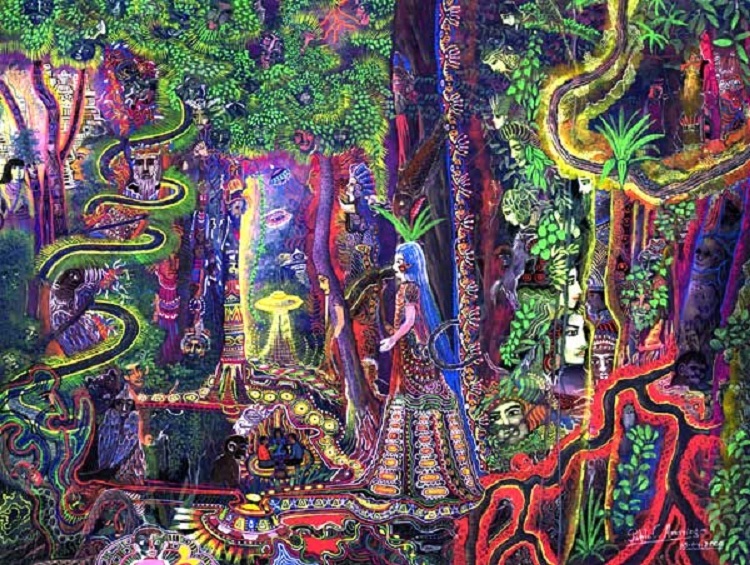 Ayahuasca is Sacred Plant Medicine. It should only be experienced in a protective & sacred field of love, created by authentic shamans. In this space, no manner of external vile energy can come in. The only fearful and horrible experiences of the mind, body & spirit come from the participants who are releasing all the horrid things they’ve kept inside. So a friend and I found ourselves at an overnight Ayahuasca ceremony at a forest lodge somewhere in the outskirts of Goa. We were two of the four 1st timers in a group of thirty in this shamanic journey. Though the ceremony was mainly conducted by two male Shamans from the Amazon, who brought the medicine all the way from there, they were closely assisted by 3 lady shamans, 2 male shamans and an amazing musician. All dressed in tribal shamanic attire that caused my eyes to roll. But I felt ok. Could feel their energy… very earthy… very good. It must have been about 10 pm by the time we all had settled down and the shamans introduced everyone to the ceremony, that the 1st round of Ayahuasca was given. 50ml of a thick dark brown liquid that tasted quite strong… jungle juiice. Then the musician began the Tibetian and Crystal Bowl sounds and their vibrations slowly started working through us gently. An inward trance was aided by occasional gentle chants for about 40 minutes. Then the shamans started singing jungle chants and lore while playing their guitar and rattles… and that’s when the magic slowly started. After some time my logical Shiva mind said – Enough! Time to snap out of all this and make sense of it. So I opened my eyes and that’s when the real thing began! I began to see many many things, subtler things I had never seen before. I immediately understood that my 3rd eye had opened and I was seeing – The Matrix of Creation. Everything that I looked at and focused on, had all its energy lines coming out in smooth geometric shapes and connecting with everything else around in shades of all colors that I could perhaps never identify even later in my senses… I had become clairvoyant! There was a subtle sound in all of it as I moved, not like the sound of Aum, but like some subtle energetic vines that were being gently stretched… I had become clairaudient too! I was experiencing the mind, body & spirit of God. I have been teaching this topic in Advanced Spiritual Alchemy since 2011. Though that teaching had come from my ancient memories, in this Aya experience, I was seeing and experiencing it in more detail and real time. For a while I felt overwhelmed with the realization of the depth of the teachings I had been sharing with others and wanted to close my eyes and take it in. But I just couldn’t close my eyes anymore, seeing all the beauty around me. The matrix is like the images below. It changes a bit every time you look at something else, and according to what is in your field of vision. It is the most beautiful thing I’ve seen in my life! I always knew deep down in my heart that God is the most beautiful thing ever. Suddenly, I began to feel very sad again… for all the human beings who have not seen what I’m seeing. I thought someday I should help them see it too. It changes you forever! After I got over that feeling, I looked at my friend sitting next to me. She was also in a gentle trance, her body swaying, a smile on her face. I could see the matrix coming out of her too. I could see her upward lifestreams. I chose not to disturb her time with God. At this point, I didn’t know how much time had passed… it must have been over 2 hours. As I looked around at people, I felt connected to them. If I kept my gaze on a person, I began to know them. Those energy matrix lines between us connected and information flowed. The shamans were going on with their loving music and many people were swaying, but some were sitting still, resisting something I sensed. After a scan of everyone there, I came back to myself and my bliss with everything. I felt connected to everything and I felt peace with everything… the ground I was sitting on, the tiny forest animals and crickets, the trees… oh! the energy of the trees was amazing! I wanted to hug them, climb up on top of them and sleep in their branches. I realized that I was also clairsentient now. In the middle of all this I began to feel this pressure in my bladder. I had to piss really badly, so I began to stand up. But to my surprise, I could not even put my two legs together and muster the energy to stand. That’s when I realized the left hemisphere of my brain had gone to sleep. So I had to muster some very very strong resolve, almost shouting at myself… Stand up! Stand up!… and it worked. It was just a 1 minute walk to the loo, but it seemed like the longest and most difficult walk of my life. It was rough earth terrain and I was barefoot and there were stones poking me I felt. My legs were bucking and twice I had the very strong feeling that I was not able to walk, so I should crawl on all my fours to the loo. It seemed like the end of that stint would be a very dirty affair, so that brought back my resolve to walk. Finally I reached the loo and that was one minute of a different kind of trance. I remember standing outside the loo and wondering how to walk back, cause my legs were buckling again. Then I was chanting to myself “Shiva Mind Come Back! 4-5 times, louder and louder each time, and suddenly when I felt my left hemisphere fully awake, I ran back with great vigor and steadiness back to my space, almost jumping onto my seat. I couldn’t believe how I did that – just a few moments back I could barely stand! Then began the next leg of this shamanic journey. I settled in for a bit and my body began its gentle sway again, eyes closed, getting into everything once again, feeling one with everything once again. Such enjoyment, such bliss, such love. But it all started to get broken with some noises, from people… vile sounds from a few of those present. At first I didn’t open my eyes and tried to ignore them but it started getting louder. So I open my eyes to see what the hell was going on. Some of the men and women had started puking badly. Some were shaking and making horrible noises from their bellies, like animals. I saw some of the lady shamans get up and go to work on those people. They could see who had bad energy coming out and who had entity possessions, so they started their rituals to free them of their spirits. 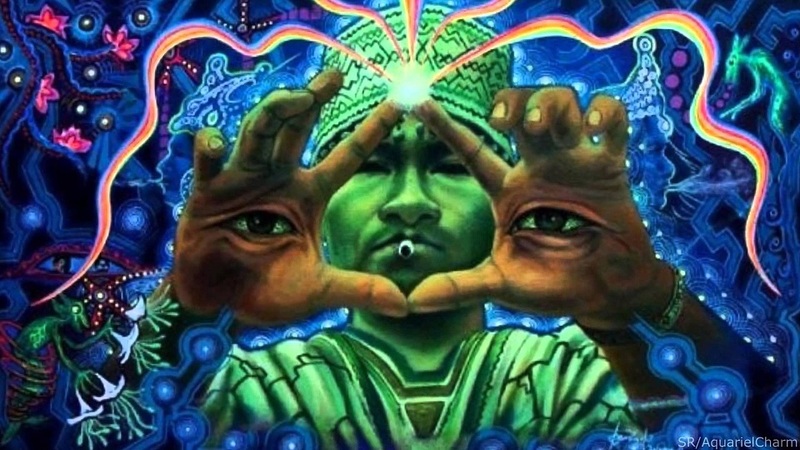 The shamans were also on Ayahuasca – They could see Everything! 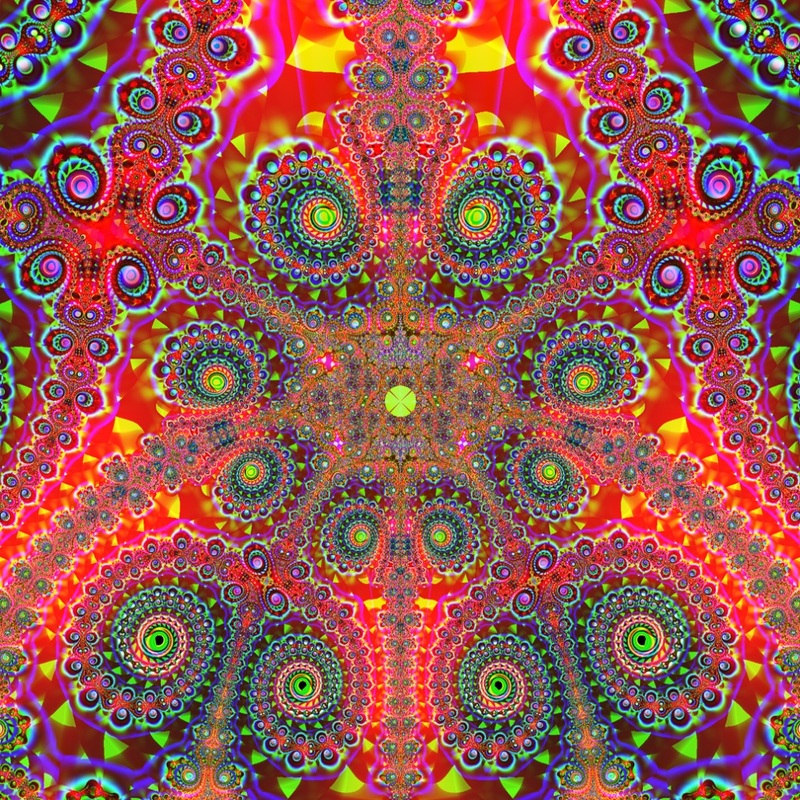 There was one man not far from me, who just kept on with his horrible noises and it really began to piss me off, because it was breaking my experience and bliss, so I opened my eyes wide again, extended my hand energetically towards him, started swaying my hand like a vortex while yanking out those vile energies out of him and then I swiftly knotted them in the air and threw them deep into the forest! As I looked back at him, he was still and quiet, eyes closed, gently swaying, a gentle sweat on his forehead. What I did, worked so fast. I brought my focus back to myself and realized, I have done this stuff before. Not in this lifetime, but before. That is why I had no fear of it and I knew how to do it. Then I did it again for a lady there. Again, it worked in a flash. I settled inward again and a message came – All healing is in the here and now. This is the field of oneness where all things are possible. This is the place where all miracles happen. I began to cry again. Truth hurts so deep. Shakti is so powerful… she can be and do anything, anytime. The only thing that may stop her is the ever contemplating Shiva Mind. After I got over my tears, and calmed down, I connected with many again. I did their group karma healings. They will start leaving their unhealthy attachments slowly. They will experience more peace in coming days, I know. The shamans were singing and playing their music all night through, I realized. That’s what helps guide and soothe everyone’s experiences. And I wondered how it was possible for them to sing and play for over 6-8 hours continuously. I thought they must be super-human. Then when I wondered why they do all of this for us, the answers came. I saw visions of them going around the world and bringing about great awakenings amongst the people, a very slow and painstaking process. They will first reach those who are ready. The 3 male shamans came around and started doing individual healings. It felt so good… chants, holy smoke, fanning, aura cleansing, patting, blowing sacred breaths, and in the middle of all this I found myself touching their feet and kissing them. I was crying again… from such love and gratitude for these holy holy people and what they do for us. After they were done with me, I sent blessings to them and all of the team in Goa who made this ceremony happen. It was wee hours of a new morning. I could feel a new me. For me, the Aya experience so was amazing and holy and beautiful, because I had already dealt with all my rubbish and there was not much of it left to come out and let go. That is why I did not puke or growl or act excessively mad. Though I’m sure I would be amazed if I had taken a video of myself all through this and watched it later – it was another me. My friend also did not puke or have any strange behavior, she was so blissful all the time and I admired that. She works with the Shakti energy in everyday life, so it was familiar territory for her I thought. Later that morning she told me that she also saw The Matrix of Creation and many other things too that were meant for her. Through this experience I was occasionally laughing and crying. I remember blessing everything. 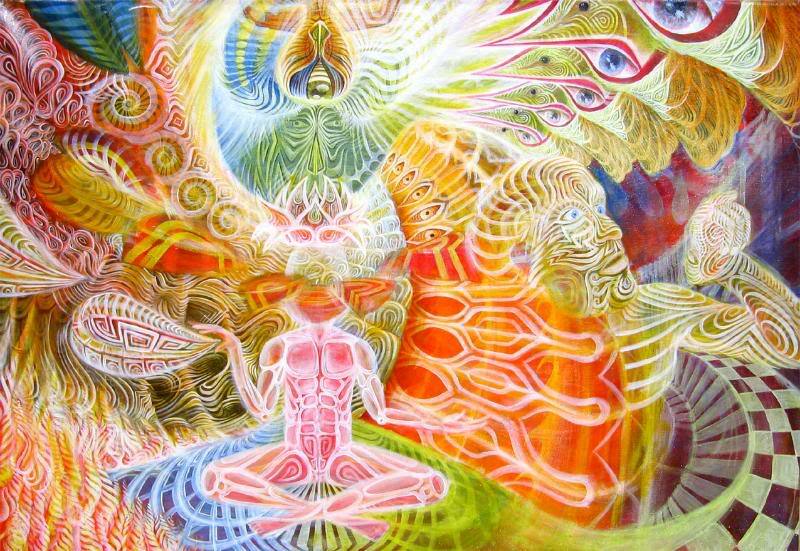 I also experienced great love with all that I put my attention to during the experience, be it the shamans, the people present, those not present (some of you), the trees, the animals, the earth & the akasha. I connected with some of the Ascended Masters and we shared the vibe of collaboration. As Below, So Above! They blessed me for contributing towards the reunions of their lower dimensional lifestreams through my work. Somewhere in between I spent some time in the Akasha with Ascended Masters Sananda Kumara & Mother Quan Yin. Through my Higher Self I downloaded new energies & wisdom needed on Earth now, especially for the Wayshowers, and Lightwarriors, and I put it in the Akasha for those who are ready to download it and use it for the benefit of Humanity. Through my Higher Self I connected with my Monad, and higher into its upward lifestreams where the Aton-Ra, Ainu-Ra and Pa-Taal breaths and memories reside. It was time for renewals in energy and remembrances of life purpose. I have not put down everything that I experienced in this journey, because it is so much, but these were some parts that I thought I must share. I wrote this experience because there is some information and learning here that people can gain from. There is a big change of the heart coming over this planet now and these are small glimpses. 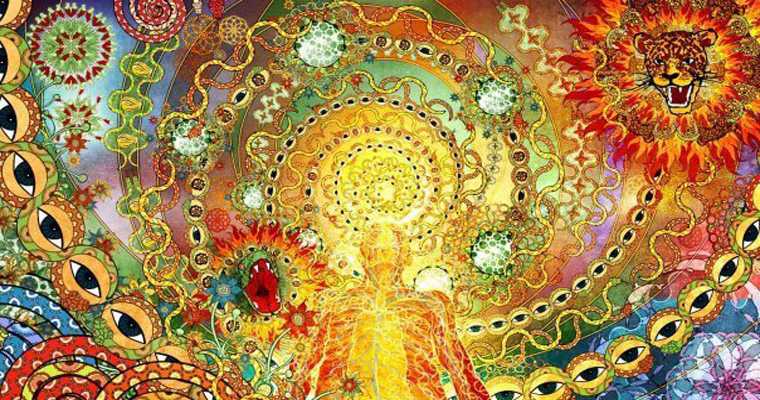 Ayahuasca is one route of the many. God has blessed us with many options and special people who will bring them to us when we are ready. I will make this part of my mystery school teachings someday. It is true that not everyone is ready for an Ayahuasca experience. If you have hell within you, it will come out during the experience and that will be your testimony. The mind shuts down, so the floodgates are open. So better deal with all your rubbish before you make this journey. Please do not ask me details of who, where and how I got this sacred experience, because this topic is still taboo in the public view. There are many fools who want to prevent people from having this experience and through it knowing the true nature of their Infinite Selves, The Cosmos and God. They fear all of this, because they are not ready for Truth. Also because they are filled with a lot of untrue learnings. I have 2 Cds of the shaman’s songs with me. Have been playing them on occasion over the last 3 days. I had to play them again this morning, before I started writing this experience. It helped bring back the memories and energies. It is wonderful how all of this works. I feel I will carry this buzz and bliss all through today. Two months back, two devis told me that I would have a big-bang awakening soon, and this it was! I had my 1st awakening in 1991 where I experienced Sabikalpa Samadhi 1st time thrice over a week. But this time it is a different kind of awakening… in the heart space… of the divine feminine energy. 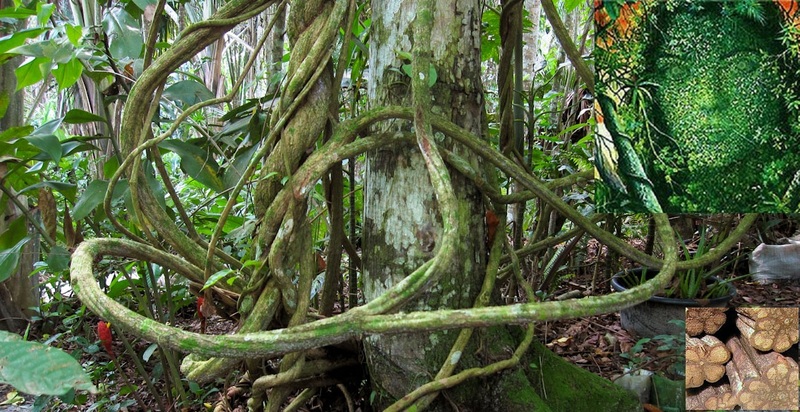 My Love & Gratitude to the Sacred Ayahuasca Vine and the Loving Shamans who bring its Sacred Medicine to us. I know why these things have been placed on the Earth and when they are to be given to Humanity. Yes Seema, she surely does. God Bless. It was my pleasure to Peter. Thanks & God Bless! Would certainly like to try this one day in ur presence.. Yes Nidhi… I will be there. God Bless! I’m so glad to have met you Darryl ! Hi Darryl, that’s an amazing journey of spiritual awareness that you took me along and I am thankful to you for the same. I live in Goa and would love to get myself cleansed at your healing centre and hopefully an Aya experience thereafter. Could you please drop me a line at my above email address so that we can connect. Thanks and God bless..
Hi Ashok, I’m glad that you appreciate my journey sharing. Yes, I will write to you and let you know how I could help you in your journey. God Bless. You had an amazing journey! I’m happy… Feel this share is so deep!